Vinegar and sugar, dried fruit, rose water, spices from India and China, sweet wine made from raisins and dates - these are the flavors of the golden age of Arab cuisine. This book, a delightful culinary adventure that is part history and part cookbook, surveys the gastronomical art that developed at the Caliph's sumptuous palaces in ninth-and tenth-century Baghdad, drew inspiration from Persian, Greco-Roman, and Turkish cooking, and rapidly spread across the Mediterranean. In a charming narrative, Lilia Zaouali brings to life Islam's vibrant culinary heritage. The second half of the book gathers an extensive selection of original recipes drawn from medieval culinary sources along with thirty-one contemporary recipes that evoke the flavors of the Middle Ages. 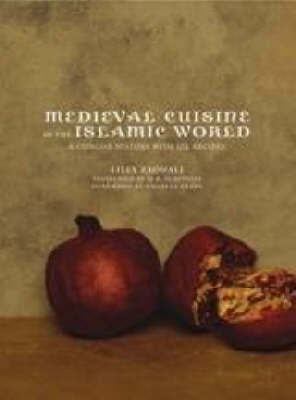 Featuring dishes such as Chicken with Walnuts and Pomegranate, Beef with Pistachios, Bazergan Couscous, Lamb Stew with Fresh Apricots, Tuna and Eggplant Puree with Vinegar and Caraway, and Stuffed Dates, the book also discusses topics such as cookware, utensils, aromatic substances, and condiments, making it both an entertaining read and an informative resource for anyone who enjoys the fine art of cooking.